It’s time to welcome the arrival of fall into your home! With the beautiful ever-changing foliage, it’s easy to grab inspiration from the outdoors to make the interior of your home feel cozier and more festive for this time of year. Wondering what elements to add to your home this season? Use our tips below for design inspiration! If you love simple touches, then this is the perfect way to decorate for fall. Getting custom made pillows is a great way to add some of fall’s charm to any room! The benefit is selecting your own fabric with color and designs that work with the fall season. With this simple touch, your guests will be impressed at how cozy your space will look with your special fall pillows! Check out your local design center for beautiful fabrics. Adding decorative hardware is a small update, but it helps add eye-catching touches to any room. If you are looking for a simple touch, go for brass colored hardware. If you want something that will really standout, try picking pieces with autumn colored stones in it, or a patterned metal. No matter what you end up picking, your space will look ready for the fall! 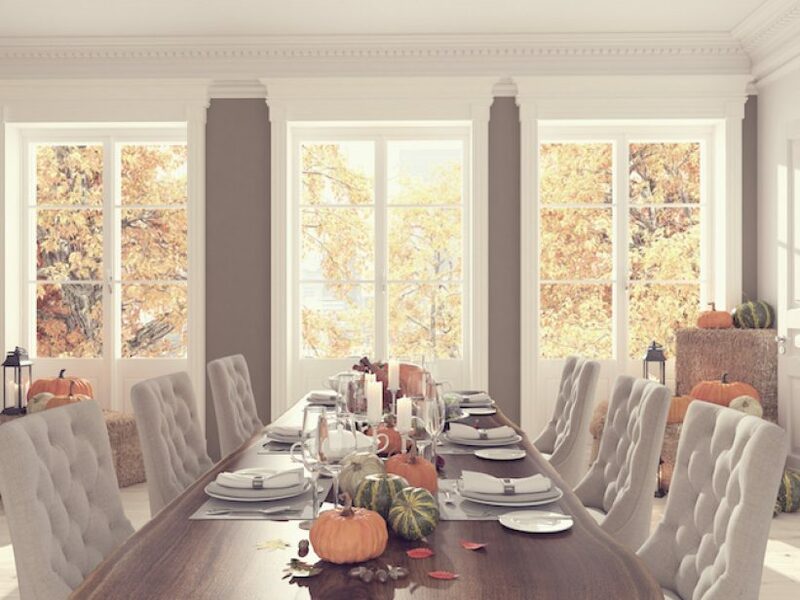 While this may be more of a permanent update, fall is a great season to update your window treatments. Whether you’re looking to add a pop of color to brighten up your décor, or you’re looking for high-tech shades so you don’t have to worry about opening and closing them all day long, Hunter Douglas offers some of the highest quality window fashions in the industry. Here at Wallauer’s Design Center, we are proudly a NY Hunter Douglas retailer. Be sure to visit one of our locations for more information on Hunter Douglas products! If you are looking for a fresh start on one of your rooms, paint it! There is no better way to freshen up a room in your home than with a fresh coat of paint and some new accessories. 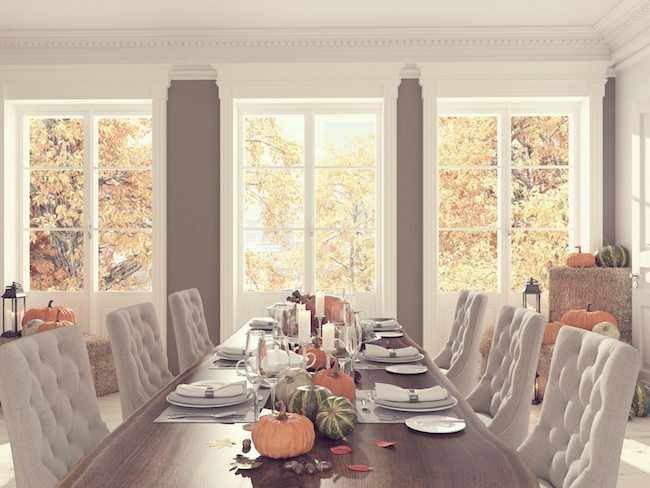 If you are looking to redo one of your rooms to make it cozy for fall (and year-round), try picking a color that will create a serene environment. Colors like deep blue, plum, or brown will make your newly redone room feel warm and inviting for both you and your guests. If you want to brighten up the room using accessories, choose colors that stand out. Crème is a great color to use when decorating because of how light it is, and can be a great contrast if you have darker color furniture! Nothing says fall more than a classic plaid pattern. Plaid is a traditional fall pattern, so there is no better time to add it into your décor! Bring plaid patterns into your home easily by adding decorative pillows, cozy throws, or reupholstering an old chair with this pretty pattern. This is bound to make your room feel comfortable and casual. Pumpkins are a fall décor staple. They are easy to add to any room or exterior of your home because you can decorate them how you want to! Use paint, glitter, ribbon, or even a carving kit for a fun DIY project to make your pumpkin one of a kind. This cute fall touch will ensure that your home is fall ready! Fall is one of the best seasons to decorate for because of all the different design ideas. If you are looking to get your home autumn ready, Wallauer’s Design Center is a great place to get started! Our design specialists will help you decide what options would be best for your home, based on your needs and budget. With our convenient New York locations, you will be thrilled that you chose Wallauer’s to help with your design ideas. Come into the store, or contact us to schedule an in-home or in-store consultation today!